If these churches could make lasers shoot out of your webcam, they would. Because they want you to know that they are on the cutting edge. Their websites are monuments to Adobe Flash, spinning logos, sound bites, and technolust as they encourage believers to see their church as reinventing the relationship between revelation and cultural presence. These churches are frequently pentecostal, neo-pentecostal, or the denominational upstarts inside historic black denominations seeking to update their church’s image for a new generation. Take, for example, the African Methodist Episcopal megachurch website for Empowerment Temple, whose senior pastor strolls onto the homepage filled with buttons for MySpace, YouTube, and Podcasts surrounded by an electrical storm. Jamal Bryant of Empowerment Temple introduces viewers to their website as “a marriage between technology and ministry,” a divine moment proving “God is not just in church. He’s also in technology.” These websites have the unfortunate distinction of being almost immediately dated, as more popular churches have adopted trendier and more self-deprecating ways of authenticating their importance. This category makes up the majority of white non-denominational and denominational websites (I’m looking at you, Southern Baptists) who want to use their websites to attract seekers and viewers for their Sunday “online experience” (live service broadcasts.) These sites are thick with artfully blanched photos of beautiful people and service projects, heavy promotion of their latest sermon series, and never-ending images of worship leaders with hipster glasses and skinny jeans. They want you to know that they have stripped “church” out of spirituality by never showing you pews, pulpits, or cheesy pastoral headshots. Rather, they feature people in the midst of life-changing experiences as a promise of things to come. 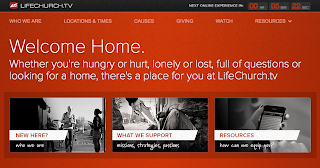 The electronic presence of the nation’s third-largest church is so significant to the church’s identity that they put it in their name: LifeChurch.tv. Their websites function as a fluid embodiment of their commitment to evangelism, cultural presence, and their persistent love of the praise band fog machine. These websites—typically from Lutheran, Episcopalian, and sometimes Methodist sources—cannot include enough pictures of stained glass, their historic building, and the robed clergy. 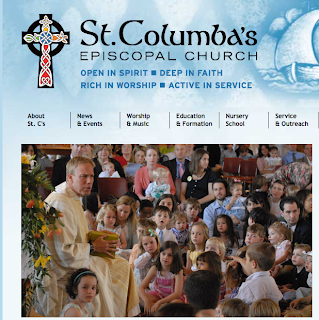 This Episcopal megachurch, St. Columba’s, pictured here, advertises itself as “Open in Spirit. Deep in Faith. Rich in Worship. Active in Service.” They want you to know that their church life will be profound, but they will never, ever try to convince you that it is jazzy, new, or even spirited. Their websites are designed to be text-heavy, shy on self-promotion, and convincingly boring. 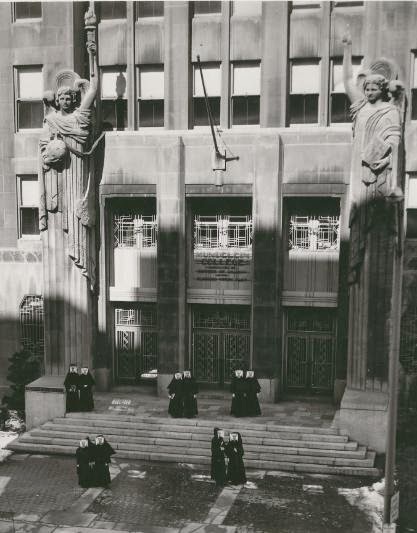 After all, the best thing they can say about their orthodoxy is that there is nothing new here. Though this is just a sliver of the riches of online archival work, these websites serve as a helpful reminder of the persistence of old debates about innovation, cultural relevance, and projections of “the modern.” And perhaps this is simply a timeworn argument re-hashed between the Old Lights, the New Lights, and now the Laser Lights. Agreed Seth! The crowded and tiny top banner beside one miniscule church shot. Those should never die. If there isn't already a Tumblr dedicated to megachurch websites then we need one. Immediately. Holy crap, Mike, that's amazing. I have a question about the lights shooting upward at the end of the intro video: is that a vision of the rapture? I might have to rethink my theological position if I can be part of that. Don Meares never saw a laser he didn't love. My favorite is the homepage moment where in the top left corner he alternates between pensive and fake surprise. Is there a category for "overworked communications director doing the best possible with wordpress and a basic understanding of PHP? Love this and now I want to know more. To echo others, are there megachurches with no web presence? Do any of them have outdated information presented or is that more emblematic of small churches trying to keep up with the larger churches who have a webmaster on the payroll? If so, I put forward yet another category: The Wannabe. And, Seth, I think that KABO defies categorization.